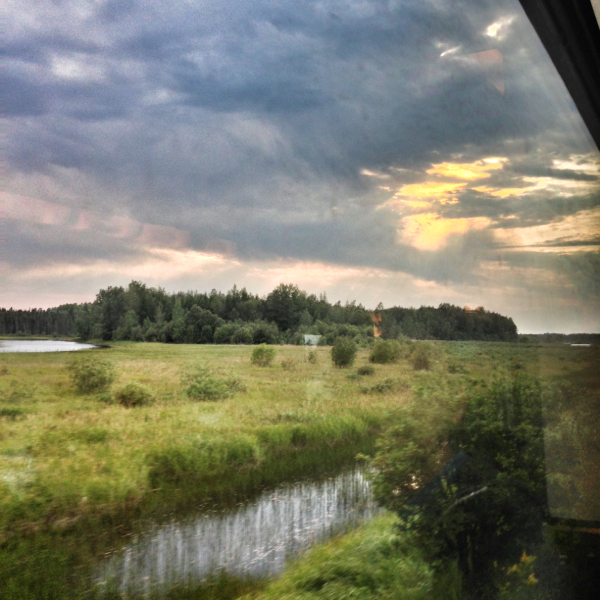 Toronto to Vancouver by train on VIA Rail's The Canadian: What to expect | eat. live. travel. write. 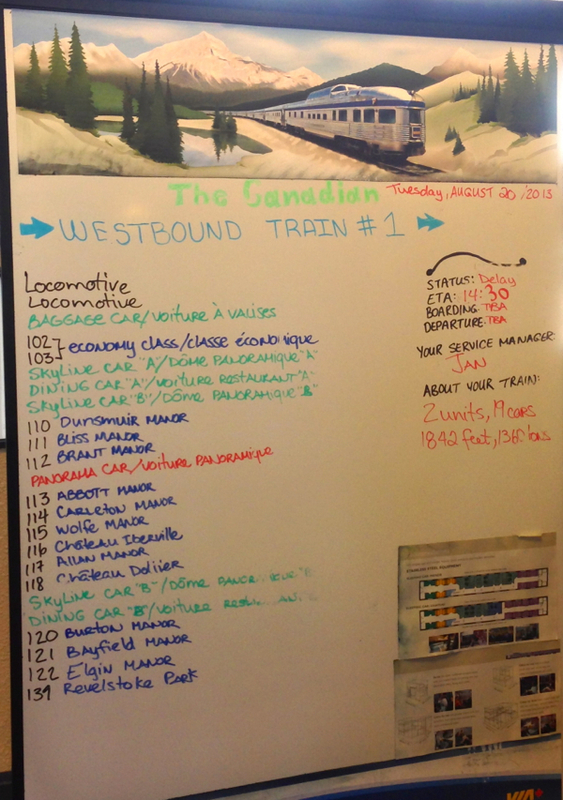 Before I boarded the VIA Rail Canadian train last month, I’ll admit to having not much idea what to expect. Having never taken a long train journey before in a sleeper cabin, I had a lot of questions and whilst the VIA site is great for the basics, there were a lot of questions I couldn’t find answers to on their site (even in their tips document) and I found myself Googling “What to expect on board the VIA Rail Canadian train” to find out some answers about things like what there would be to do, what the cabins were really like, did I need to bring my own towels, were the meals as good as everyone said they were, where would the train stop and what was there to do at the stops. I didn’t find a post that quite covered all my questions and when I was on the train, a lot of my fellow passengers echoed my questions so I figured I’d compile as much information as I could in one post that will hopefully be useful to future passengers on board The Canadian. A lot of people hear the words “VIA Rail Canadian” and automatically think “expensive”. Whilst this is most definitely not a budget journey, if you are savvy with your booking and keep an eye out for sales prices, you might be surprised at some of the deals. Be aware that there are different booking classes so make sure you know what you want to book (compare each class’ amenities here). The Economy Class and Berths can be much more affordable during VIA sales (hint: look for the “super saver fares”). According to a poll of my fellow travellers, a one-way fare in a the Sleeper Class “Cabin for One” was as little as $1000 in the period I travelled and a Sleeper Class berth was around $800 (both one way prices). Bear in mind that the Sleeper-Class options include 4 nights’ accommodation, 3 meals a day and snacks/ coffee/ tea/ juice all day. 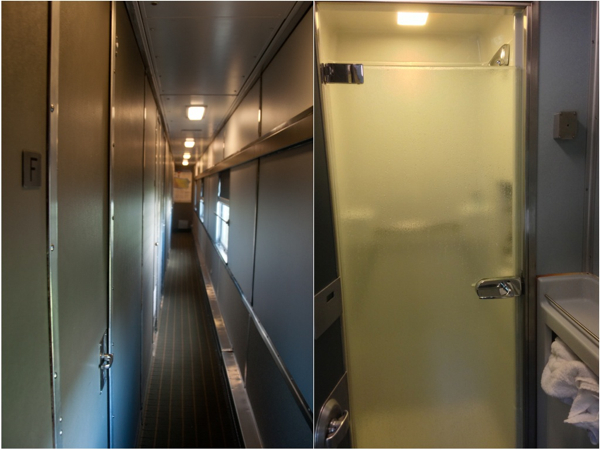 VIA Rail has a number of different options to suit varied budgets: Economy and Sleeper Plus which includes Berths as well as Cabins for 1, 2 or 3 people. Blanket and pillow set including polar fleece cover, neck pillow, eyeshades and earplugs, available for purchase. Light meals, hot drinks, refreshments and alcoholic drinks are offered at affordable prices. You also have access to the Skyline car, which offers snacks and beverages. Certainly the seats were roomy-looking (much more leg room than the glass-topped “Dome” cars where Sleeper Class passengers spend their days) and they all had electrical outlets (something which the Dome and Activity/ Café cars do not have – if you want to charge something in Sleeper Class you have to go back to your cabin and I don’t believe that the berth passengers had access to electrical outlets in their areas). Note that the Economy fares do not give you access to showers and there are no showers in the stations where you stop for long enough to take one. Also, meals are not included but you can purchase basic meals and snacks for reasonable prices in the bar/ café car just next to the Economy car. The berths convert to large, comfortable seating during the day. Though it might seem a little like school camp, the berth beds are pretty wide and apparently very comfortable. Keep in mind that the top berths do not have access to any window light so it can get pretty dark up there and some people I spoke to found it very disorienting! Toilets and showers are located at the ends of the carriages. 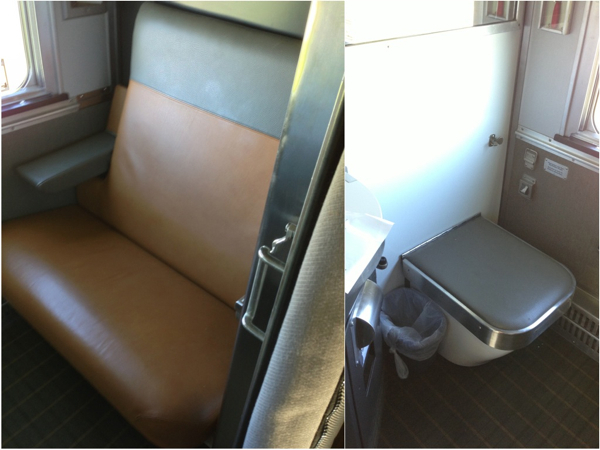 The cabins for one are a tiny “room” with a large-ish seat during the day facing a private toilet. The bed folds down over the toilet at night so if you need to go, you’ll have to go down the corridor, where the shower is also located. These were apparently fairly comfortable and, for what they were, great value. Cabins for two and three people have enough space for a couple of small carry on bags as well as their own private toilet room (cabins for three people have two toilet rooms as they are simply two cabins for 2 joined together) and access to the shower at the end of their car. It’s best to try to shower in the morning (I never had to wait for the shower) as there is I found there was more hot water at the beginning of the day than in the evening. Also, if you can plan your shower trips during one of the many many stops that allow CN trains to pass on the tracks, you won’t have to deal with the swaying and rocking of the train which, for someone like me who suffers from balance issues, was fairly challenging. Bring flip flops for the shower – they also help to anchor your feet to the ground if the train is moving! There is a sink with drinking water in each cabin as well (though the drinking water was not functioning on my journey, the staff kept us well supplied with fresh water bottles). 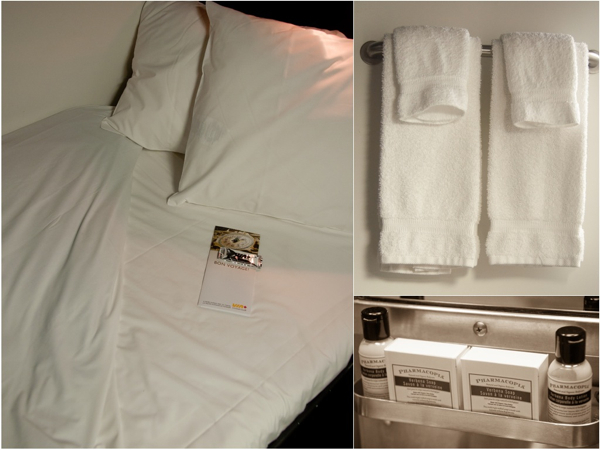 You’ll receive a personal shower kit (towels and toiletries) as well as turndown service each night if you choose. Your cabin will be reconfigured for the daytime with chairs (the beds fold into themselves) although after one day of trying the “daytime configuration”, I requested they keep the bed down during the day also – the chairs are vaguely reminiscent of dentist chairs (well they were for me) and not at all comfortable for sitting and reading. The bed, on the other hand, was super comfortable both for sleeping and for reading propped up on the pillows during the day. I mean, when you can just lay down and watch the world go by from your bed, who needs a daytime configuration? You probably won’t spend much of your time in your cabin during the day anyway as the views are definitely better from the glass-topped cars (The Park and Skyline cars). On my journey, people tended to wander up to these cars right after breakfast and kind of stayed there all day. As I said in my previous post, the scenery out of the windows is mesmerizing and you won’t do half the work/ read half the books you think you will! In the Sleeper-Plus cars, you will be greeted by your cabin attendant who will look after you for part of the journey (the crew changes in Winnipeg). Make sure to ask the location of his/ her cabin in case you need them as well as the location of your dining car (the car number is helpful here – they are on each door as you go through between carriages so make sure to look as you are going through the train) and your Activity/ bar car. These are important pieces of information as there is no “map” of the train layout provided (i.e. “You are here”) and I will admit to spending a fair bit of time wandering around trying to situate myself and the various cars/ features of the train. In Jasper Station, however, we finally got an overview of the train layout – the crew in Jasper told me they like to have this info available for all passengers as they board. As far as I know this was the only station where this information was available – would have been useful to have at the start of the trip too. 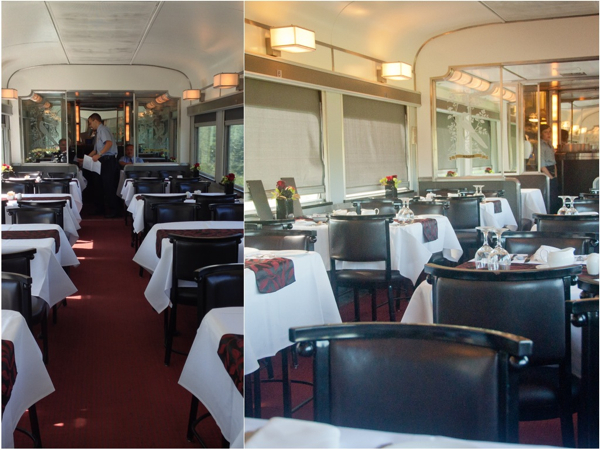 Note that the much spoken-of Panorama Dome Car does not join the train until Edmonton so don’t wander up and down the train endlessly wondering if there is a secret entrance like, *ahem* some people did! I actually wasn’t the only one and finally we asked our “Activity Manager” who informed us that we were not going crazy, but that the car wasn’t on the train just yet. I am fairly certain that this piece of information was not included in any of the VIA literature I read before the trip. In Edmonton you get to watch them add the car to the middle of the train which was a lot of fun! (if you have kids who are interested in trains, make sure you find out which cars the Panorama will be going in between and park yourself on the platform so you can watch the process. It’s quite fascinating). If you’re interested in following the progress of the train along the way, be sure to ask (at the station before you go, otherwise on the train) for a map of the journey as well as a timetable. These seemed to be in very short supply during my journey but I had been lucky enough to have a check-in agent who insisted on getting me the timetable and letting me know all the stops (both long and short) that the train would be making. This certainly helped “plan my time” (and I use that in the loosest sense of the word “plan” since there is not much you need to plan on the train!). Make sure you check in with a VIA employee each morning as to the time on the train. You’ll be going through three different timezones and if you are like me, you’ll be completely confused much of the time. Also, you really don’t want to miss the train when you are off exploring in Winnipeg, Edmonton or Jasper so make sure to double check the current time and time of departure before you get off! 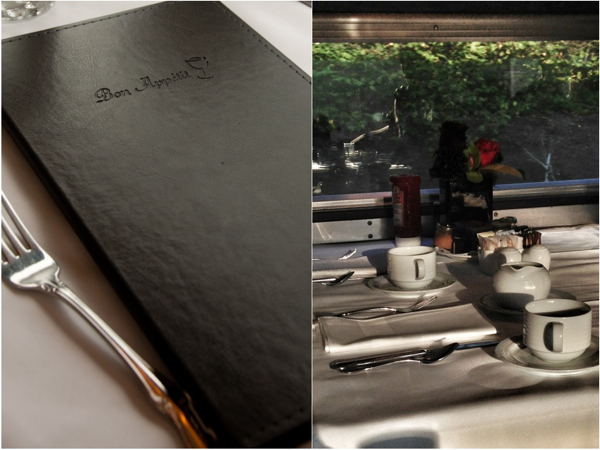 If you’re travelling in “Sleeper Plus” class, all your meals will be included throughout the trip. You can check the menus here if you really want to know what you’ll be eating beforehand (click on each Day for a detailed list of the dishes). There are three meal seatings (early, normal and late) and when you check in at the station, you will get to choose your seating for the first days’ meal – after that you’ll choose at dinner the night before. There are some meals where it’s first come, first served (brunch after you leave Edmonton and breakfast the day you arrive in Vancouver) so make sure that you are prompt otherwise you might have to wait a long time. The different seatings attract a different crowd with parents travelling with children tending to book the early seating while the “bar crowd” head out to the late seating. The second seating is definitely the most popular and the busiest. I ate at all three seatings and would recommend the first or second, especially at dinner, because it is generally still light enough to see some of the scenery – the third seating I ate dinner it was pretty pitch black outside! 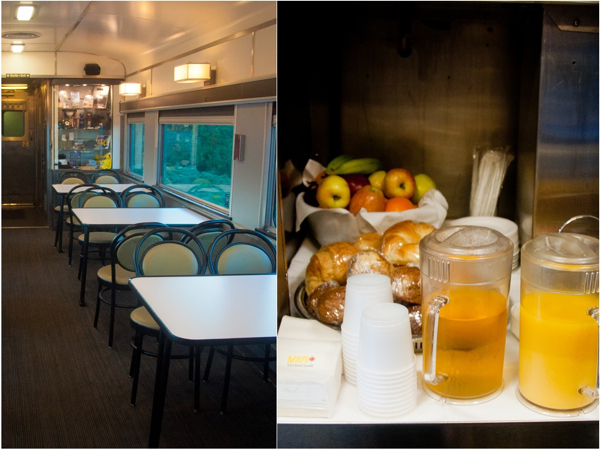 If you get hungry between meals, each of the “Activity Cars” has a little “café” area where you can help yourself to tea, coffee, juices, water and muffins/ cookies/fresh fruit throughout the day. I’d find it hard to believe anyone can get hungry in between the meals on offer but the water and fruit were welcome touches that I took advantage of – it’s dry air on the train so the water was necessary and the fruit – well, many of the meals were on the heavy side, I felt I needed something a little more virtuous!. The meals themselves were pretty decent for train fare, it must be said. 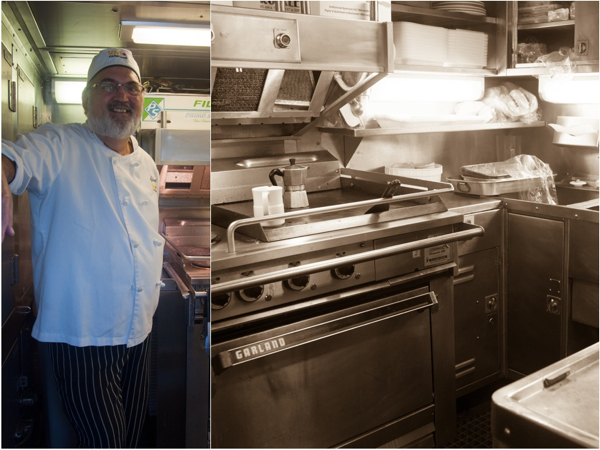 Given the tiny galley kitchens the chefs are working in and the amount of food they are pushing out at each mealtime (around 120 diners per dining car per meal over three seatings), it’s pretty impressive. Not to mention the whole “working on a moving train” aspect of the job! Brunch on leaving Edmonton was a little more interesting. I can recommend the duck confit Benedict, although 3 eggs was slightly too many considering the sedentary lifestyle you lead on the train! 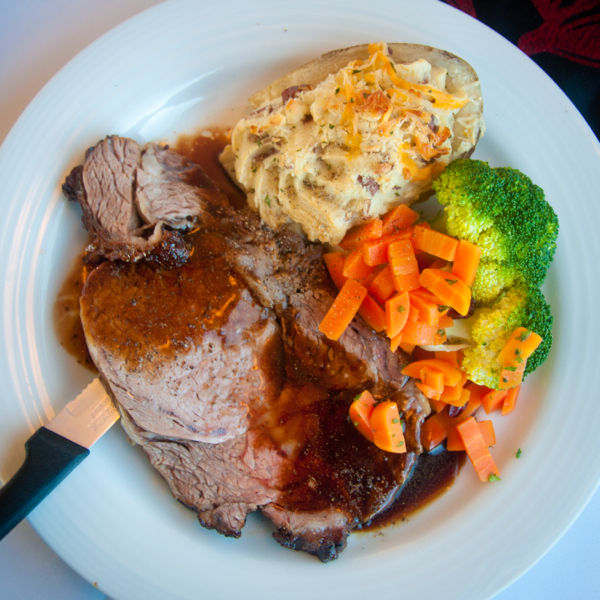 My favourite dinner had to be on the second night – Prime Rib of Beef with a Rosemary demi-glace. Not bad for train food, indeed! 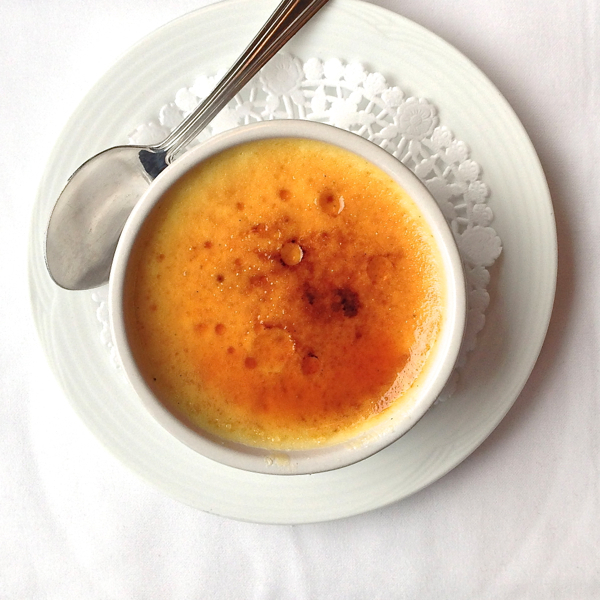 The desserts always looked promising (like the crème brûlée, below, which, sadly, had no crunchy toffee to crack with the back of your spoon on top) but they were a little disappointing to be honest (they are one of the few things not made on the train and included things like brownies, apple crumble, ice cream (though there was s spectacular cherry ice cream at one meal) and cheesecakes). Not that you even needed a dessert at lunch and dinner, to be honest! I found the meal service a little rushed (except at the last seating when it slowed down a little) and a couple of times asked to take the dessert away to enjoy at my leisure in my cabin or in the Dome car with a drink and this was perfectly acceptable. I guess you don’t know if you don’t ask! Overall, the food on the train was good. Not spectacular but solid. It was much better (for non-vegetarians) in terms of the choices we were offered once we’d left Winnipeg – choices for lunch on that first day somewhere in Ontario included a Canadian beef burger, a salmon cake (the nod to “regional specialties”), a wrap and a quinoa salad, none of which was anything that special. Indeed the vegetarians on the train drew the short straw – one lunch, when the rest of us were enjoying a Cobb salad, a shrimp/ scallop dish (this was excellent!) or a turkey sandwich, the vegetarians were offered hummus with crudités and pita bread. As one of my fellow (vegetarian) passengers remarked, “Hummus is a snack, not a meal”. Right. The staff did work hard to accommodate dietary restrictions like gluten intolerance though, I noted. The offerings became more impressive as the journey went on with Prime Rib and short ribs making an appearance later on as well as an impressive looking veal chop, sesame-crusted tuna and pan-seared duck and some of these dishes incorporated regional ingredients of the provinces you were passing through, like the scallops and shrimp served with a Saskatoon berry salad. Definitely some nice touches in there. What about drinks? Well these are not included in the cost of your meal but you can buy them with both lunch and dinner and throughout the day in the Dome and Lounge Cars (not in the Panorama car, take note). 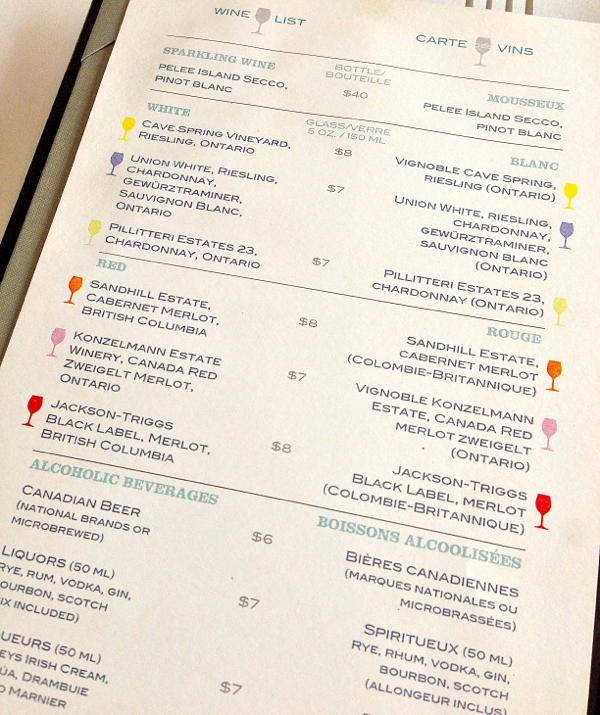 It’s a fairly short, all-Canadian (of course) wine list that even I (the non wine connoisseur) felt would have benefited from some more choices. I do have to say I did appreciate the fact that they were all colour-coded to help you pair them with your meal (each dish had a different coloured glass next to it on the menu and that was the recommended wine pairing – helpful when you don’t have your in-house sommelier (aka Mr Neil) on board with you! 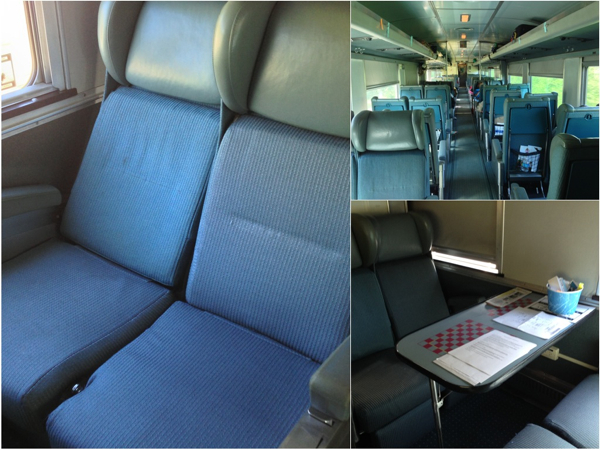 What is there to do on board VIA Rail’s The Canadian? You can always check the activity board in your “Activity Car” for a rough idea of what’s going on each day… When you are passing through areas of interest, there are often announcements over the PA system about the area and its history but it’s not consistent across the Activity Managers – some will give you more information that others but I found all were happy to answer individual questions if you have them. These people are a wealth of knowledge about the train journey (many of them have been doing this for years) so take advantage of that if you have questions. 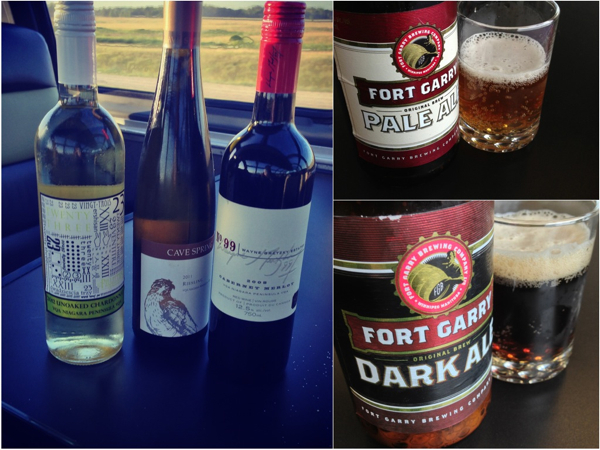 Most days on the train, there was some sort of Canadian wine or craft beer tasting (if you are keen on this, make sure it doesn’t clash with your chosen meal time as there are no repeat tastings!) and we were greeted with Canadian sparkling when we departed from Toronto and then again from Jasper. 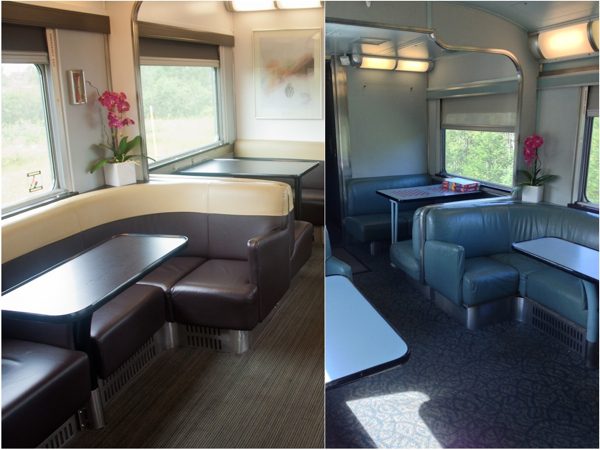 Or you could simply hang out in one of the many lounge cars located at various points through the train. The car at the very end of the train, the Park Car has great views out the back window and also a TV area that sometimes showed movies for the kids on the train. The other lounges were quieter and people tended to congregate there to chat, read, (attempt to) work, have a drink or just take in the scenery. There’s really not a LOT to do but then again, that’s the point, right? 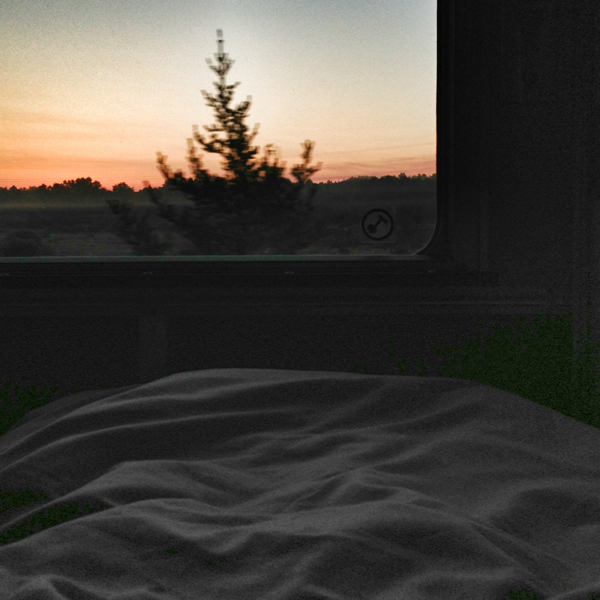 Where to sit for the best views/ photos on board VIA Rail’s The Canadian? Your cabin is great for watching the world go by but the window is quite low so you might not want to stay there if you are interested in the scenery on a large scale. The Dome topped cars (The Skyline and the Park) are perfect for checking out the scenery though it’s quite challenging to take photos up there – nevermind that the train is moving, the glass is curved and reflective! At the back of each of these dome-topped cars there is a window that looks back on the train which is a good vantage point for photo enthusiasts for a few reasons: the glass (because it’s facing backwards) is much cleaner that the same window at the front of these cars and also there’s a little ledge where you can place your camera (or mini tripod) so it doesn’t shake (so much). Right, so there’s all the information a curious traveller like myself would have liked to have known in advance of my trip – I hope this is useful for people who are considering this journey and the bottom line is, if you take this train, you simply cannot be disappointed in the overall experience. It’s a once-in-a-lifetime “must” in my books! LAST DAY! 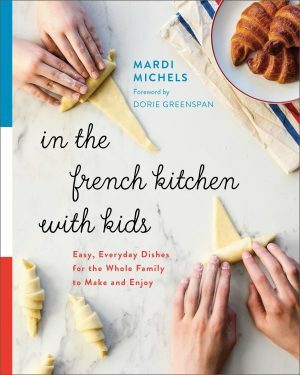 WORLDWIDE giveaway: Clotilde Dusoulier’s The French Market Cookbook (she of Chocolate & Zucchini). Closes Wednesday September 25th at 6pm EST. This looks fun! I love train rides. The view is great and you can sit back, relax, and play cards! 🙂 There is something about a continental breakfast that just makes me so happy! Yup it’s such a relaxing and civilised way to travel! Canada really is a gorgeous country. Would love to see it by train some day. Whoa, where do I book. That is some train, some journey and some scenery. Great post Mardi. I think many will now add this journey to their ‘bucket list’. You would really enjoy this one! i would definitely ride the train when i next visit canada. May i know what is the best season to do it? Spring, Summer or Autumn? I think all seasons have their charm! Great tips Mardi. Definitely a trip to take. I’d love to do a trip like this, didn’t know it was possible! I’m always put off by travel in North America because of the lack of public transport. Ever since I was little, I have always wanted to take that trip! I still hope to one day. I’m definitely saving this link for future reference. Thanks for your insights! You’re welcome – it’s a special trip for sure! It is wonderfull to read your blog, and the comments of the few. I worked for the CNR for 39 years and travelled extensively on the train. I appreciate that Via has kept so many of the great services and a staff that are so pleasent. I can,t help but warn people that if they have allways wanted to take a trip , do it soon as the Federal Government is doing its best to reduce subsitys and this will pretty much sabotage the service as it stands if not deal it a death blow. The staff really DO make the trip special! Thanks for sharing all this information, Mardi! It sounds like a great way to see the country, and I think it answers a lot of people’s questions about the trip! Thanks for all the helpful information. I can’t wait to get on the train in about 2 weeks. It was thoughtful of you to put this together for future train travelers. We just came from Brazil to do this trip. Can u tell us if have any internet services like wifi? Thanks e congratulations for the incredible post. Hi Roberto, NO internet in the trains themselves, just in the stations where you stop. Enjoy! This is a fabulous article full of info not found elsewhere. I am doing it for my bucket trip..in june and i am delighted to hear details of train activities and what one should know.it is very interesting that panorama car is not initially on the train. thanks for such specific info. So very enjoyed your post. Will be taking this trip in a few weeks and you provided the BEST information we have found to date. THANKS!!!! So glad to know you found this useful! Enjoy the trip! This was such a great article. We are leaving in a few weeks and I was looking for all of these answers. We have booked an upper and lower berth. Is there anywhere we could charge our phones or camera batteries? Did you notice anyone with berths leaving their seats as beds all day with the curtain closed? Im wondering if we need a nap, if we can take it. In terms of charging your devices, there are outlets in the lounge and café cars but not the Dome/ Panorama cars. I think there are outlets in the berth section but I would check beforehand. In any case I had outlets in my cabin but was rarely in it to charge my devices – I managed with the outlets in the café/ Activity cars. Re: the berths, I am pretty sure that during the day they are converted to seats – I did not see any that were left as beds. Again, double check with your cabin attendant when you get on (or phone beforehand). Enjoy – it’s quite the trip! Thanks a lot for the usefull information. Besides it was fun to read it inspired me to change my entire traveling schedule. Instead of flying to Calgary and travel from there to Vancouver I decided to take the train from Toronto and booked a ticket. In June this year i’ll make the trip. Hi Arald I will be doing the trip from Sweden in October and would love to know what you think. Thanks for a great article Mardi! 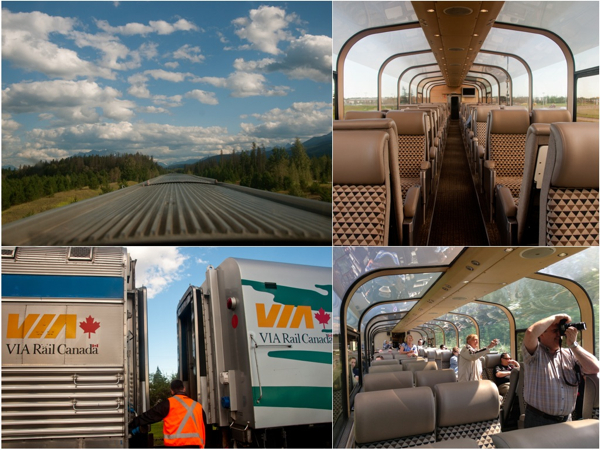 The Canadian by VIA Rail say’s it all. There is No “Be there hours Early” standards, No long lines just to get in/out of Customs, No where am I attitude, while you expereince the true Canadian in you aboard the VIA “Canadian” train. I would have loved to do what my kids had just experienced & I would of loved it more if I was there to share it with them. Just from what I have seen in pictures and videos is experience enough. “BUT” when they can’t stop talking about it you know in your Heart it was the “Best” time one could experience. From a father who has that “Workaholic” standard in my life & missing the true meaning to being Canadian. Thank You VIA Rail for the experience my kids will never forget! Thanks for your comment – I am so glad your kids enjoyed this trip – hopefully you will get to enjoy it too someday! Thank you so much for you information. We are visiting Canada from Australia and travelling from Jasper to Toronto next month. Much appreciated. That’s fantastic – hope you enjoy the ride! Hello, Mardi, we are going to do the trip Toronto to Vancouver in June. Thanks a lot for the helpful informations. Is it posible to have a translation in german? Hi Bettina, Great news re: you doing this trip – you will love it! Re: translating, well I don’t speak German, sorry. Some Internet browsers will translate for you (like Chrome) if allow it to… Sorry I can’t be of more help. I am sending my husband (67)on this trip. Strictly train ride. Will be in Vancouver from Monday 9:30 a.m. To Tuesday 10:00 p.m. Trying to figure what he can do/ where to stay in this time frame without him getting totally lost :). Any comments would be good. I did this trip 2 years ago, but I’m more outgoing and can find my way around and was in Vancouver for 3 days. Excellent and detailed review, Mardi! I am looking forward to this trip from Vancouver to Toronto, albeit in late November, so the landscape might be quite barren by then – still beautiful I’m sure. Also couldn’t help but notice that the train attendant wrote the length and weight of the train in imperial. It’s Canada! Can’t we just finish the switch to metric already and use metres and kilos/tonnes? Especially for a company like VIA, it’s kind of disappointing. It is great to follow the ramblings of many. To Shelly– the reason for the “imperial ” measure is that the railroad industry has not been forced to change to Metric because of safety and the sheer magnitude of haveing to get all the railroads in North America on board with our Canadian program . As you know The U S has not and probably won,t be using the metric system. So for now sit back , enjoy and watch the mileboards slip by.Have a great trip. We are going to Halifax in Aug. from Saskatoon. My husband and I just planning the trip from Jasper to Vancouver in early September as part of a 2 week stay in Vancouver and the Rockies. The information you gave is fantastically helpful – thanks! From the VIA Rail website there seem to be plenty of good discounted deals and special offers on fares (though none yet available for the time we want to travel). Any advice on these would be great. Hi Lynne, Glad you found this useful 🙂 What advice were you needing re the fares? Thanks for the quick reply! Just wondered if there are any drawbacks or conditions to getting the discounted fares (I already know that some fares have a penalty for cancellation). Also, we’re looking to travel from Jasper to Vancouver on 2 Sept, and the deals don’t go up to that date yet. Any idea when we should start looking for early September deals? Hi Lynne: Happy to hear you anticipate traveling on the “Canadian” this fall. Yes, as you mention there are many discounted fares that have either penalties applied if cancelled or may even be non refundable. Regrettably we do not have advance notice of sales but I would suggest that you sign up for our newsletter to receive notices of upcoming promotions. Additionally we have a section on our web page called Express Deals that might be of interest to you. Thank you Norie-Lyn! I’ve signed up for the newsletter. 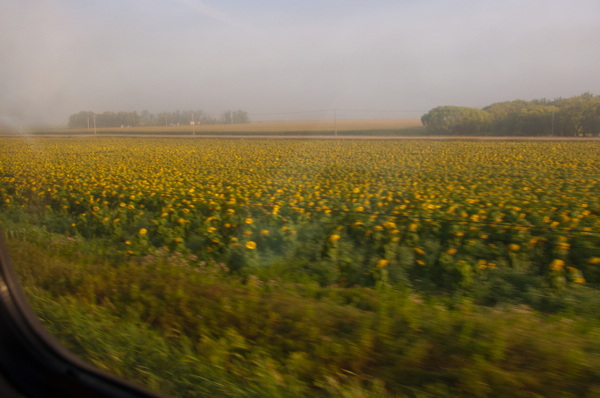 And thank you Mardi for connecting me to VIA Rail. Excellent description, just what we needed! We had already booked the journey for October 2014 over the internet with VIA Canada before finding your article. You answer many of the questions that VIA hadn’t made clear. I find it strange that when seeking the stations between Toronto and Vancouver on the VIA site you get a list in alphabetical order! 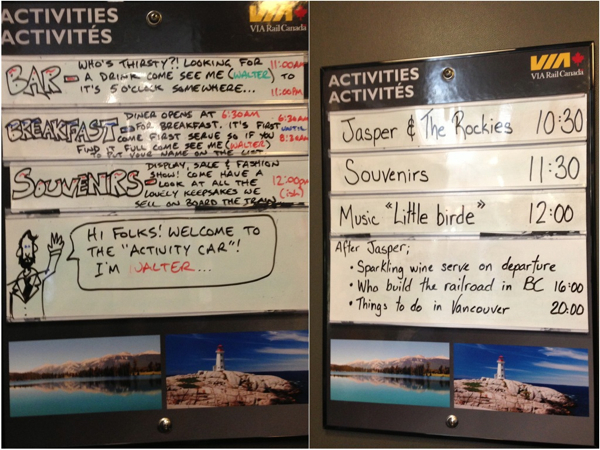 Is there a chronological/geographic list somewhere (available before Jasper)? When you get on the train you can ask for a pamphlet that lists the stops and stations in the chronological order 🙂 Enjoy! Thank you so much for all the information. I’ve always thought a train trip across the country would be ridiculously expensive. When I saw the deals offered by Via Rail, I thought someone at Via had made a mistake. It was too good to be true. Your web site turned out to be the tipping point.. I booked a cabin for 1 this morning (at almost half the regular price!). Will be leaving at the end of August. Can’t wait. Thanks again! Yes the deals VIA offers sometimes are very reasonable – lots of folks on my trip had bought the “cabin for one” deal last summer and it was also much less than they were expecting. Enjoy your trip! If you go on the website you will be able to input your dates and choose which class you would like to travel in and see the cost for yourself with lots of different options! thank you for the prompt response mardi! yep thats what i did awhile ago and i think i will book our travel now. 😀 thanks to you! There was some space in the cabin for luggage but I just had a carry-on sized bag so I can’t speak to having much luggage in the cabin itself. They are quite small once the beds are down so I would try to have a small amount of luggage only. 1) The dome car availability is well hidden but it is actually on this page :http://www.viarail.ca/en/explore-our-destinations/trains/rockies-and-pacific/toronto-vancouver-canadian/classes-and-trains-cars#plus This did not bother me though as we will leave this train in Jasper and go by rocky mountaineer from Banff to Vancouver. 2) you say that It is possible to find the menus and give a link for it but I cannot find any menus for the sleeper car class ? But no matter I will enjoy the travel. And just as a compliment I found that the schedule you can print on this link http://www.viarail.ca/en/explore-our-destinations/trains/rockies-and-pacific/toronto-vancouver-canadian/schedules actually is quite good. But you can ob´nly rprint it not get it into your computer. Thanks for this comment (and I hope you enjoy your trip!). Thanks for the updated info re: the Panorama car – although I swear that must have been updated since I did my trip. 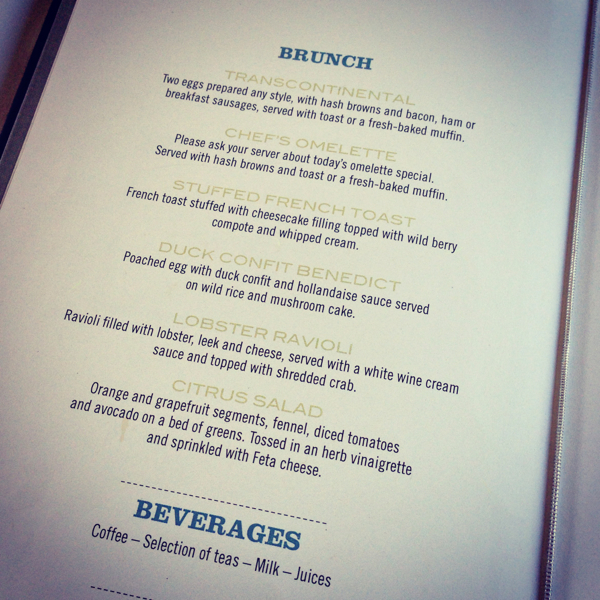 Re: the menus, it seems they are not online anymore although they were certainly there when I wrote this post. I guess they took them offline. Skulle bli intressant att veta vad ni tycker om tåget. Sweden here too! Would be interesting to know what you think of the train trip . I am going in October. Vancouver to Toronto. Thank you so much Malcolm. Your comment is helpful indeed! Now my friend and I don’t have to worry about being separate in the train and don’t need to change our plan either. Thank you again..! I am glad you found this post useful Lynne 🙂 And you’re right – VIA does offer awesome deals! We expected it to be good, it wasn’t! 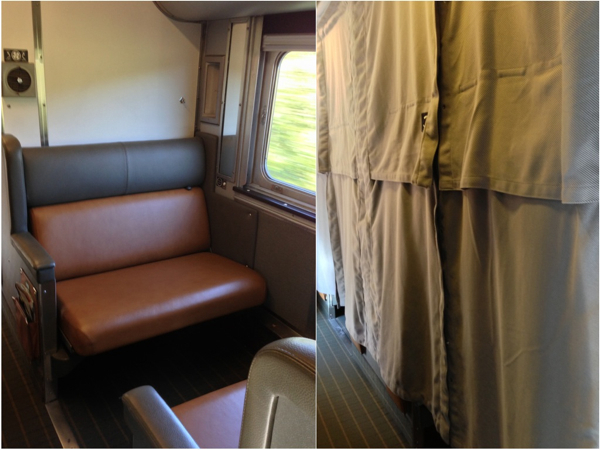 Comfortable facilities, excellent staff cared for us, good food and all this on “a train”! We enjoyed meeting and chatting with our very interesting fellow passengers. It was also great value for money! What a great article and very informative! My husband and I have been considering doing the Toronto to Vancouver rail trip for some time but had never seriously got down to booking or doing anything about it, but this year we decided it was time to just do it as we are both Seniors and figure it’s now or never while we’re still both healthy! At first my husband was not keen on doing the train journey from Toronto and was suggesting we flew out to Calgary or Edmonton and then take the train from there, but as I have always wanted to do the whole trip by train I have finally convinced him after looking at prices on the Via website and now having read this whole article out to him! So thank you for helping to change his mind. We’re lucky that we have friends living on Vancouver Island who want us to stay with them so now all we have to do is decide on how long we want to stay over in Vancouver before heading to the island. We have one concearn regarding the sleeping arrangments. We would probably book a cabin for two but we’re both a little nervous about climbing up into an upper bunk and wondered if you had done that or spoken to anyone who had to do it and was it easy to get up considering our ages and abilities (over 65 years old)?! In any case it would be an adventure we both look forward to. Thanks again for a great article. 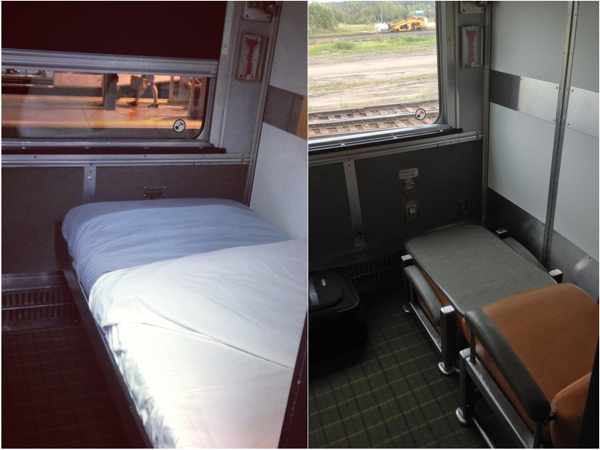 Hi Andrea – I am so glad my article was useful 🙂 In terms of the bunk bed question, I am afraid I can’t help you (I do see the new Prestige Sleeper Class offers a Murphy Bed for two, though) but will reach out to VIARail who might be able to better respond to your question. Have a fabulous trip!! Hi Andrea. 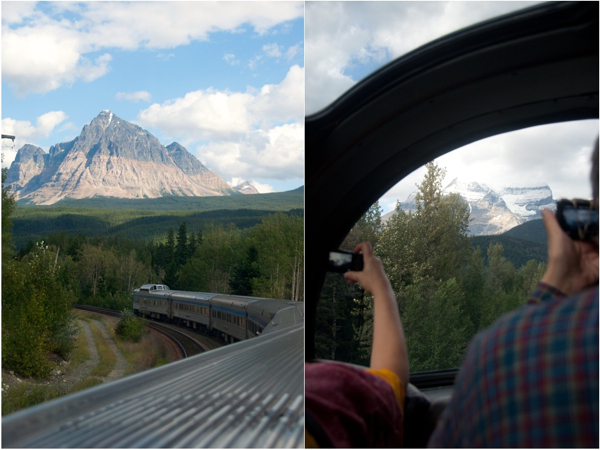 My husband and I travelled from Jasper to Vancouver last September on the train. It was a great experience, even though it was only for one night. We had the cabin for 2 with our own bathroom and washbasin. I am 67 and my husband is 75 (he had the lower bunk). I had no problems getting up and down to the upper bunk (though we are both pretty fit). We managed to get a great deal on the VIA website (look out for their offers), which enabled us to travel in great comfort for little more than the economy fare. This included all our meals on board (canapes and sparkling wine on arrival, 4 course dinner and cooked breakfast). The food was excellent. I’m sure you’ll have a great trip. Thanks for chiming in, Lynne! Appreciate this extra info! 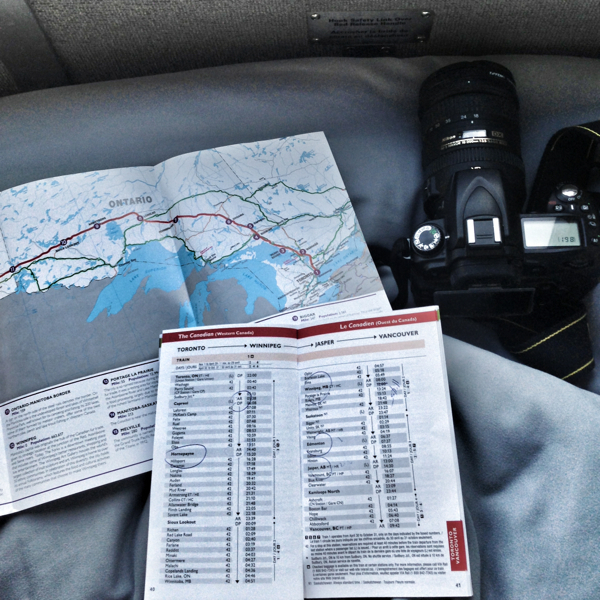 Just to let you know we did the Saskatoon to Halifax trip last fall, and enjoyed it imensely. Great article. Is there a way to ship your car from Vancouver so it will be there in Toronto, either on the same train or an earlier train? Thank you so much Mardi. You seem to have answered all the questions that I was thinking of after reading ALL the information on the VIA website. Like you, I couldn’t find sufficient information to enable me to make certain choices. I just couldn’t get my head around exactly what they meant by the different classes. Now, thanks to you having made the journey for us and giving us excellent details, including photographs of the various cabins and sleeping arrangements I now know what to do. I would also say I missed the point at first regarding the prices. There are no deals available at the moment so at first look I found the prices expensive, but when you stop to consider the four nights accommodation and all meals etc. it really is a good deal. Plus, after reading all the comments, I will wait a week or so before booking to see if any deals come available. Thanks for sharing and greetings from the UK. You are so welcome – glad the post was helpful and yes, keep on looking for the deals (I think you can sign up to be notified for info on price deals etc…). Enjoy! My husband and me want to take the Toronto Vancouver train. Which is the best link to see the options and buy the tickets. Is it possible to buy a upper berth and lower berth ticket. I am booked for the Jasper to Toronto trip in January. I am traveling alone and at 86 was a little nervous as I’ve never traveled by train overnight before. Your article and readers comments relieved quite a lot of that. Thank you so much. Like several others I’ve wanted to take this trip for years, and when I found it was available in winter that sealed the deal. Oh you are so welcome – glad the info and comments were useful! Enjoy the trip – it’s a blast! or Toronto to VAncouver ? 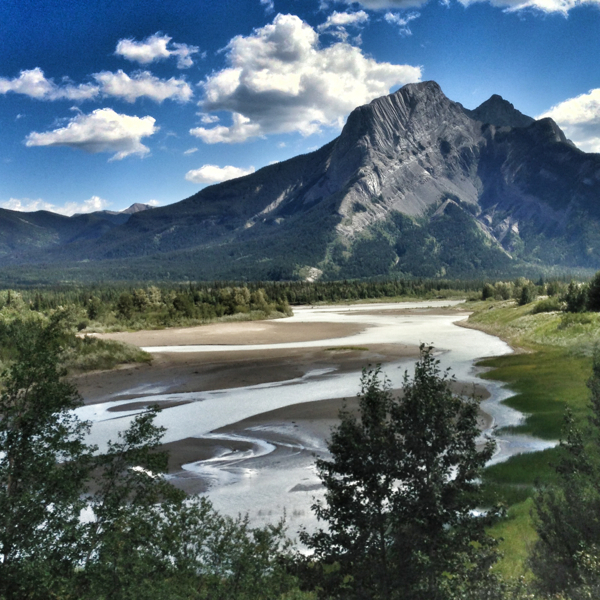 I definitely saw a lot of beautiful landscape travelling from Toronto to Vancouver – we saw the Rockies in the daylight if that is something you’d be interested in? Thank you for sharing. We are looking forward to our trip on via rail. May I know whether it’ll be cold at Night on the train or when it passes through the mountain area? In the sleeping cabins there seemed to be plenty of blankets – I don’t think you will have a problem! This is great and you’re right about there not being a lot of good intel out there! And yeah – watch for sales every Tuesday + apparently Black Friday is the best. Wish we had been on the same train. I would love to have been on the same train as you! Looks like the post is standing the test of time too 🙂 Thank you for reading! Hi, I’m planning on taking this trip this summer and I found your comments helpful. It’s where they make up your bed and turn down the sheets and maybe leave a little treat on your pillow! Thank you for all the great info Mardi! I’ll be on the train one week from today and, after reading your blog I am even more excited! Can I get the maps and scheduled stops in the Panorama Lounge at Union Station in Toronto? Thanks again Mardi. Hi Barb, I am pretty sure you will get all that information in Toronto – if not, as soon as you get on the train! Enjoy, it’s a great trip! OH MY!!! Thank you so very much for all this fantastic information. DH and I have just booked the trip from Toronto to Vancouver. I’m so looking forward to our trip! Fantastic – I am glad this was useful for you! Enjoy the trip! Could you please send us information on your train trip from Toronto to Vancouver.we are a senior couple and we would like a double room with meals. I have responded to you via email but you will need to contact VIA Rail for this information. Looking for Berth, Meals included, and Pricing Please. You’d need to go on the VIA Rail website for that information! At the end, you said this whole trip “WAS” sponsored by via rail. ?? Is that a type-o? Did you mean was “not”? No it is not a typo. 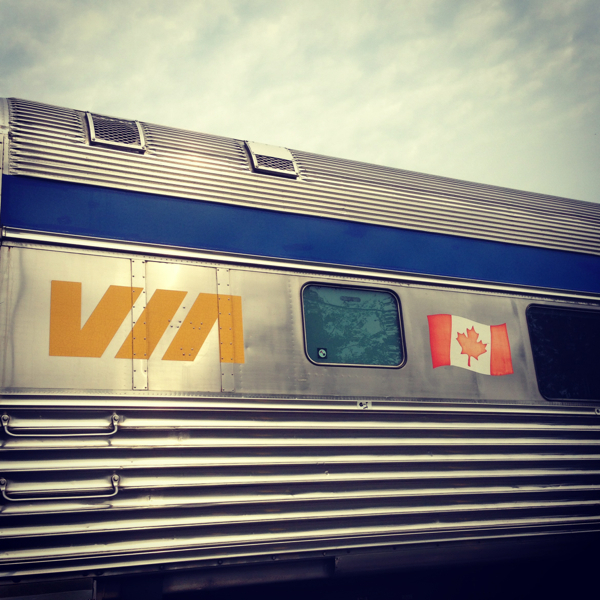 The trip WAS covered by VIA Rail.